While most of us are busy debating traveler vs. tourist, I am caught in a dilemma of checking the night life or the early morning activities of a city irrespective of being a tourist or traveler. Taking the debate further focused there are people who click sunsets and then there are people who click sunrises. It is an altogether different thing that you cannot tell the difference between the two if you look at the picture. Unless you know the city very well and are aware of its monuments and where the sun sets. 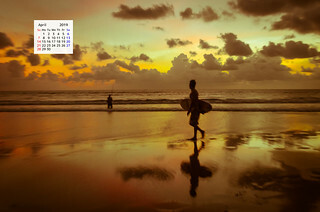 To the best of my knowledge Sun has a set pattern and a prescribed route that he has not deviated for last billion or so years, hence is very predictable. I am more of a sunset kind of a guy, more because I don’t need to get up early from my cosy warm bed, wait for a hot cup of Tea before and drive to the location before Sunrise. I am more of a guy who loves to be early for sunset, wait for the sky to change colors and click then go back to whatever I was doing and continue with my exploration of the city. 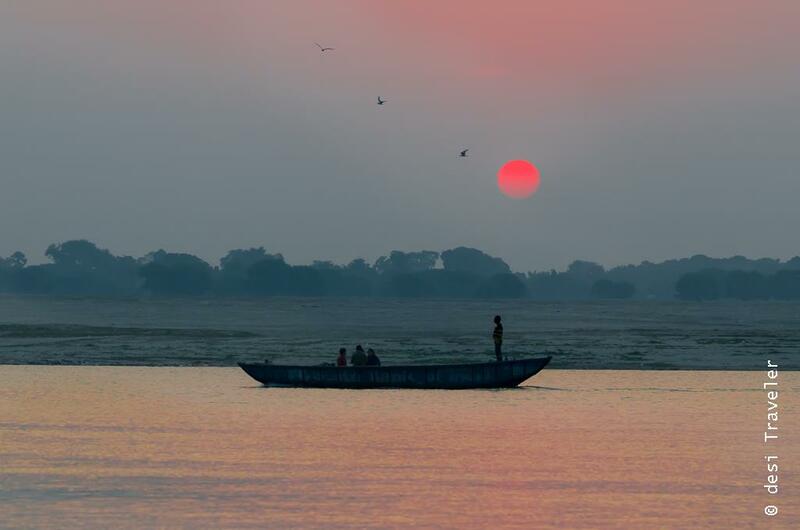 But Banaras, Benaras , Kashi , Varanasi and now in the time of hashtags the city of Lord Shiva is now trending as #VaranaSee, is a city that makes you get up early in the morning, for it is one of those cities where Sunrise is much more gorgeous than the sunsets, purely on account of its geography. Though this does not mean that your evenings will not have any activity in Varanasi, simply go to the mesmerizing and choreographed Evening Aarti in Varanasi you will enjoy the experience. 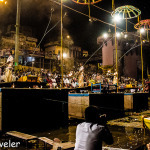 You see Kashi is a city of many contrasts, in India where we celebrate life every day; people come to Kashi to die in peace. While Ganga maiya – गंगा मैया (that would be Holy Ganges for those preferring the Anglicized name), flows in opposite direction in Varanasi. 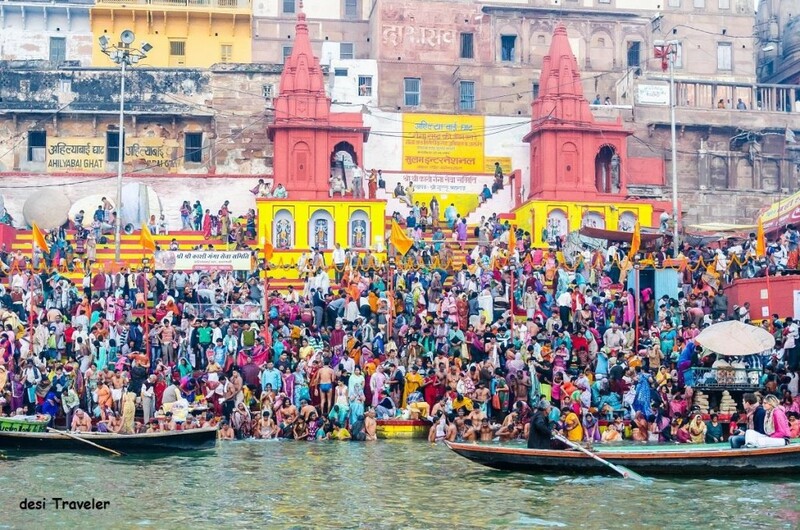 The normal course of Ganga is from West to east, but in Varanasi, Ganga Maiya flows from east to west, thus giving the saying, “Ulti Ganga Bahana” – उलटी गंगा बहाना or the Ganga is flowing in opposite direction, a herculean task by any means. 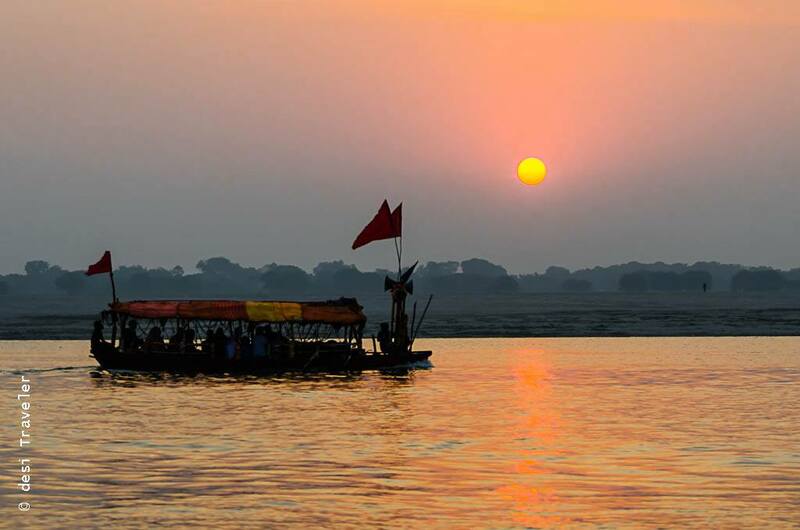 Most of the action in the mythological city of Varanasi is between the two tributaries the River Assi and River Varuna, joining the Ganga. 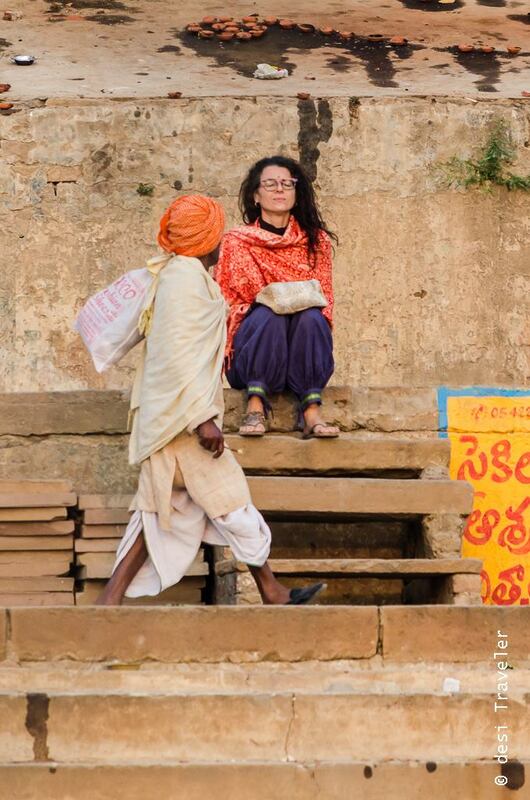 As Varuna meets Assi the city is called Varanasi, after the two rivers. Well you will be hard pressed to find River Assi, near Assi Ghat as it is more or less a drain now, but Varuna still has some water most of the year. So after this brief desi history of Varanasi, which you could have easily learned from Wikipedia, let me take you to one of the misty morning in Varanasi. As I mentioned due to the Ghats being higher than the river bank, the Sunset in Varanasi is not a great spectacle as it hides behind the buildings, but the sunrise in Varanasi is spectacular as slowly you see the dark banks change colors and the first rays of a still yawning Sun, caress the frolicking waves around us. From the Ghats a bucolic Conch sound pierces the fog around us as and hundreds of river terns welcome our presence by circling our boat. We ask our boatman to switch off the hoarse diesel engine and let the boat drift on the waves. Nobody is in a hurry least of all me as we want to just soak everything around us in the river and on the Ghats. I check my camera settings and get ready to capture some action around me. As the light gets better we start clicking pictures, sometimes focusing on the passing boats, sometimes on the action happening on the Ghats. Some vendors on the smaller boats look at us with a glow in their eyes and row towards us, soon we are offered Bottles for Ganga Jal, small idols of Gods and goddesses, Prasad, holy threads and food for fish, that actually attracts the River Terns and other birds both local as well as migratory birds who flock Ganga for food. On the bank, brave hearts are taking their daily dip in cold waters, surrounded by all kind of discarded pooja stuff from marigold garlands, to floating red clothes, that could have started journey on a funeral pyre. But when you see death lingering around you every second, you don’t get worried about some discarded flowers, that only yesterday have seen hectic activity in Bansphatak Flower Market . 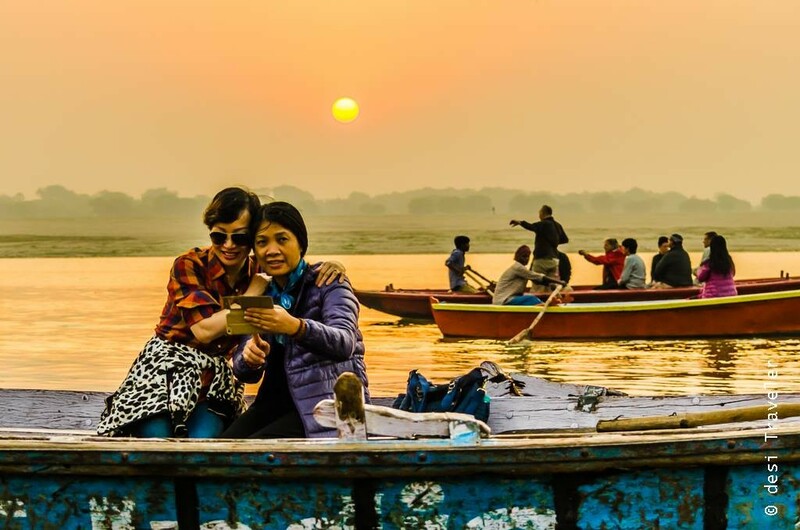 It is all part of Varanasi, just like you accept the pandas, the Ghats, the funeral pyres, the desire to moksha; you also accept all the filth around you as part of package deal. 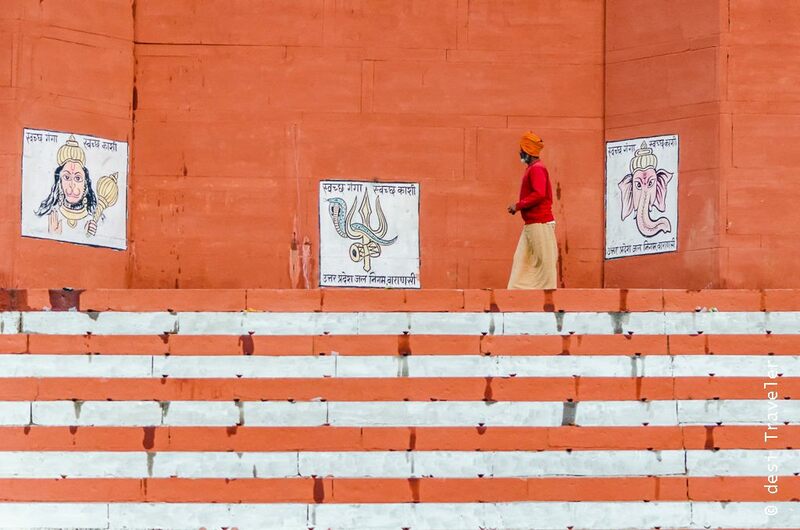 I guess the ultimate test of an Indian pilgrim in Varanasi is to maintain her fathomless faith and focus on the formless divine chanting mantras, all while dodging the drifting discards all around. 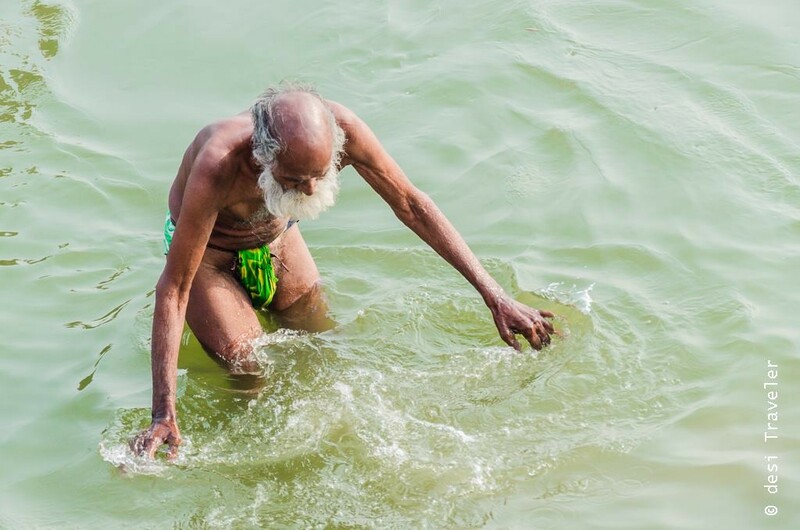 The dip in the holy water may last from a few seconds for the first timers, as they rush back to the safety of shore from the cold waters to a long ritual by those who do it every day and clearly are locals or mendicants looking for coins in the shallow shores. The tourists, stayed safely in the boats, while the travelers walk on the Ghats, shoving their cameras in anybody around in Ochre. All this while the pilgrims try to wash their sins with prayers and a holy dip, the locals continue with morning ablutions in the holy waters. 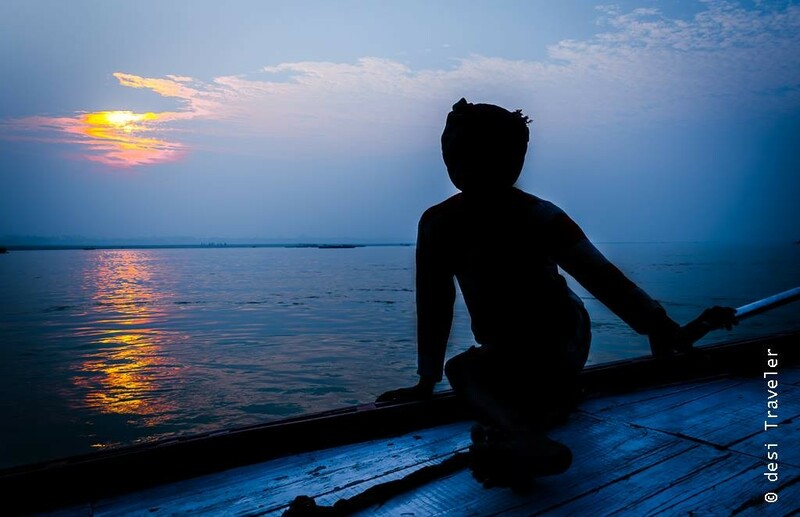 No matter what your avatar in Ganga, in one form or other we are all there to experience the magic of the divine waters, that accepts our sins and discards in her flow never judging, never questioning. 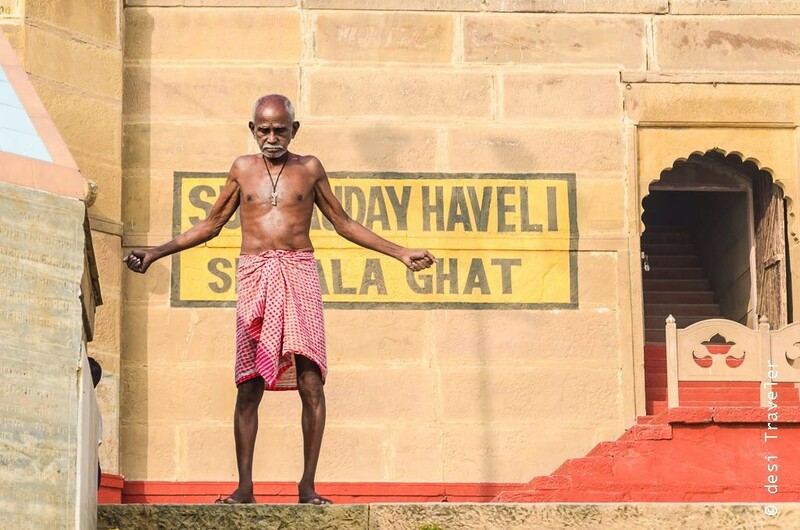 As the sun rises, the activities on the banks become more energetic, and crowded, with no place to even stand on popular Ghats like Dashashwamedh Ghat. Yet almost like clockwork a wave of pilgrims arrive and takes a dip in waters and moves back making wave for the next wave. 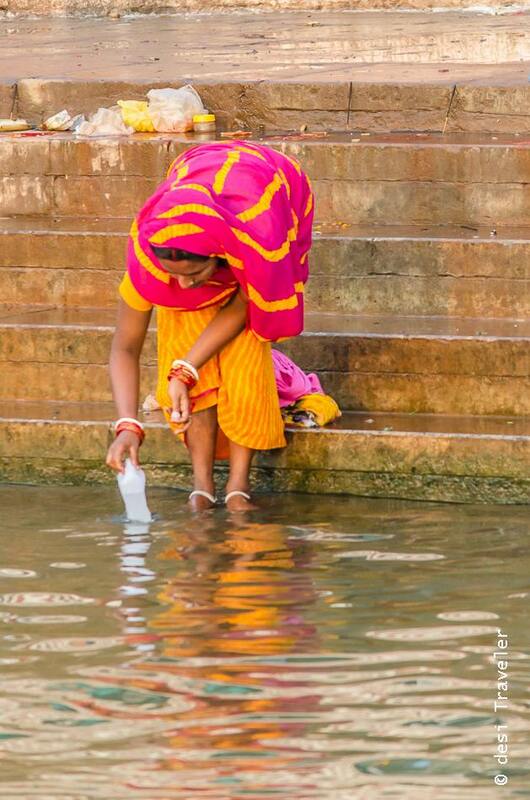 The waves of Ganga Maiya, embrace waves of humans, taking their sins with her. 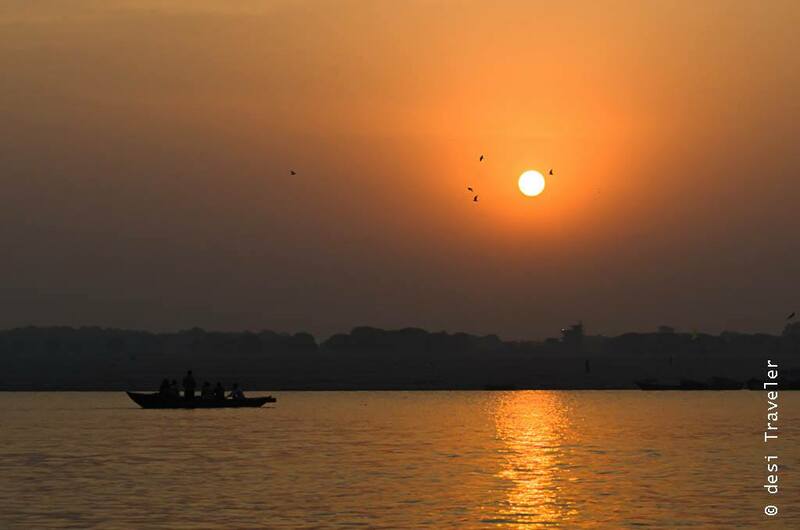 Now the obvious question that one may ask from the popular folklore is – While your sins that you accumulated in the world are washed in Kashi ? Where will you go to wash the sins accumulated in Kashi?” Well I don’t have an answer, may be this guy does in the picture below does. काशी के पाप कहाँ धोओगे ? 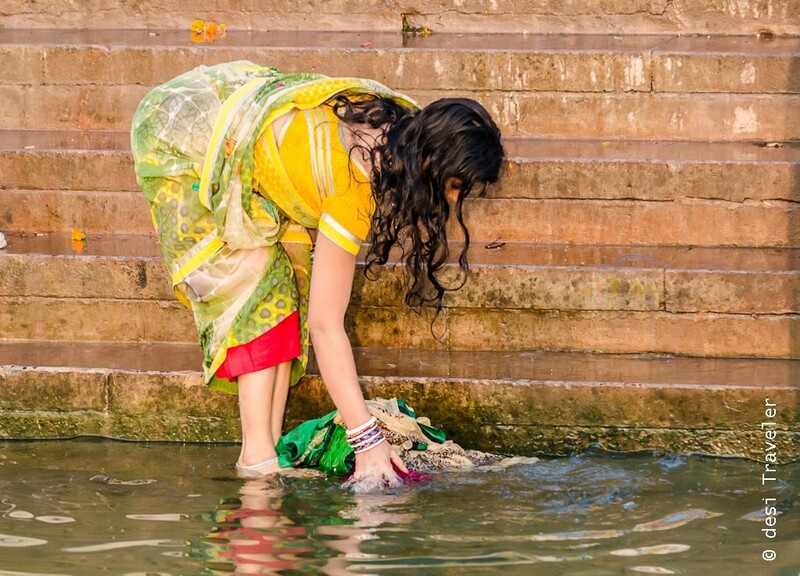 Where will you wash sins committed in Kashi ? The boatmen are locals and depend on rowing boats for their livelihood, and it is a good idea to support the local community. But remember they start with quoting a price, in which you can hire a helicopter. So remember to bargain hard. Depending on how many people / exclusive boat you may have to pay anywhere between Rs 50 for a shared boat to Rs 1000 for an exclusive boat dedicated to you. But it will all depend on your bargain power and if it is an auspicious day with lots of crowds. As on busy festivals like Kartik Purnima or Dev Diwali boats are in high demand and prices skyrocket just like airline tickets. 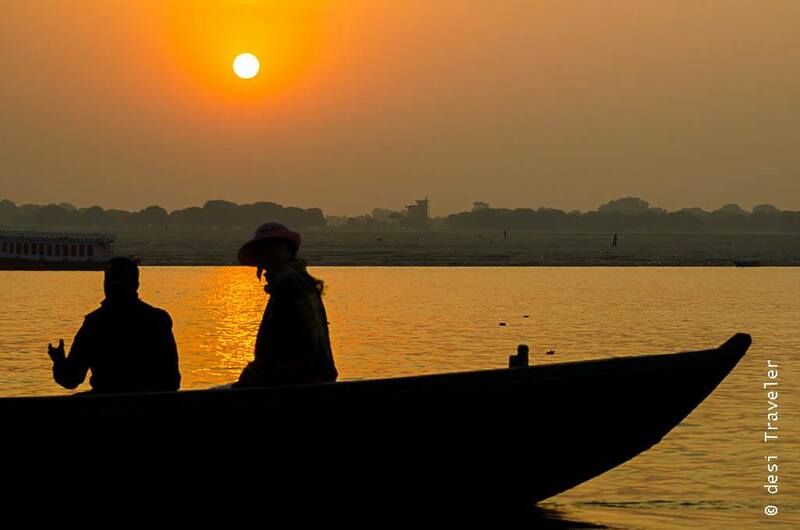 Make sure you discuss clearly the Ghats you will cover, and the time you will spend in the boat. Clearly tell them for how long you want to hire the boat and how many people will be in boat. 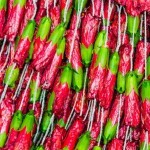 If your main aim is to click pictures you should stay away from the crowd otherwise your shots will come all cluttered. As you will want to click both the ghats and the sunrise, I suggest you carry a zoom lens that has a range of 18-105 mm or higher in case of Nikon, and 24 -105 mm in case of Canon. As you will be in a boat, if your lens supports keep the vibration reduction (VR) or Image Stabilization ( IS ) function on for clicking sharper pictures. While you may be tempted to change lenses on the boat it is not the smartest of things to do with waves, birds, and splashes all around you. So I suggest you carry an all purpose lens like this or if you want to change lens make sure the boat is not moving and then carefully change the lens. 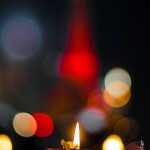 Some of the popular ghats with lots of action are Dashswamedh Ghat, Assi Ghat, Man Mandir Ghat, Shivala, the Manikarnika Ghat and Harishchandra Ghat are active burning ghats with pyres burning round the clock, I would suggest you be extremely sensitive to sentiments of people around in clicking pictures there. Hey Prasad and fellow travelers. 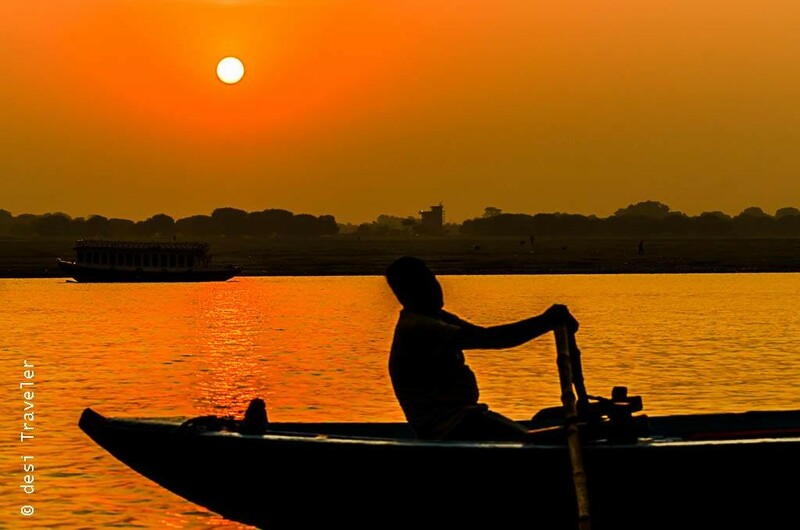 I am a solo traveler and planning a trip to Varanasi this summer from Delhi. 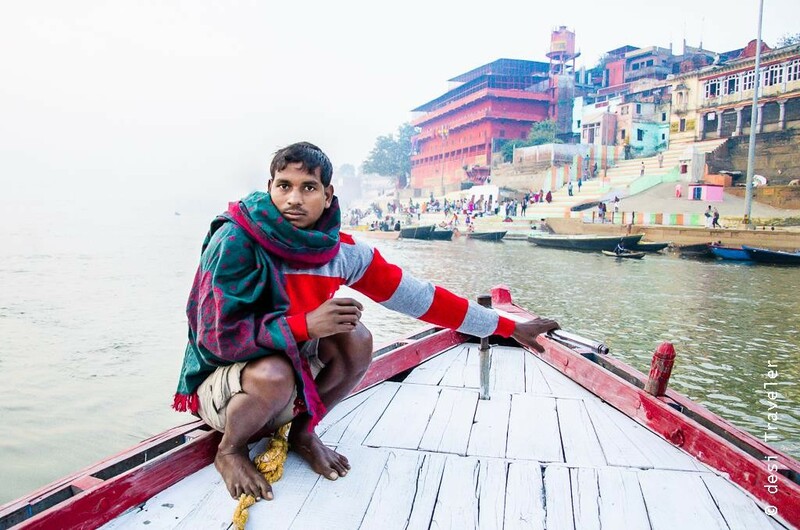 Can you tell me from which ghat I can take a sunrise boat ride and how much do these boatman charge…anything specific i should plan apart from photography, is it mandatory to hire a guide? Also which place i should go to meet saree weavers? 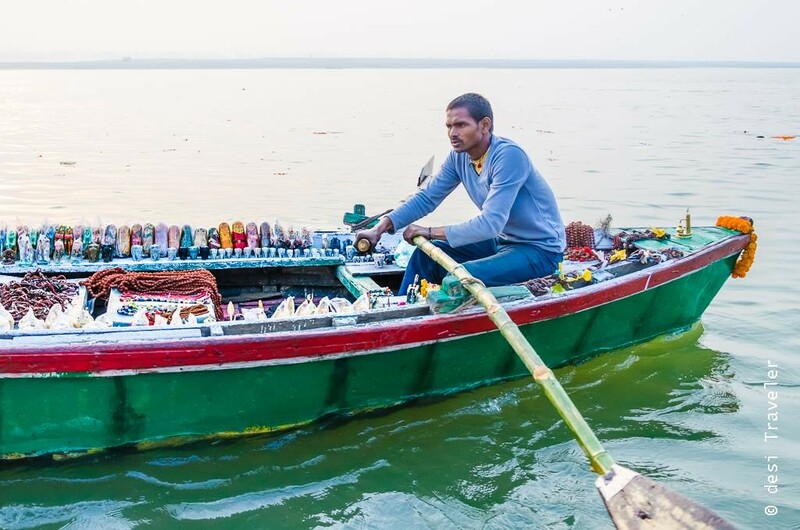 Hi Anurag…Technically you can take a boat from any Ghat in Varanasi but for best experience start from Assi Ghat as it is one of the first prominent ghat and then go to the other side and come back. The charges of boatmen depend on the number of people sharing the ride, time of day, season etc. and begin with as less as INR 50-100 for a shared boat to maybe 1500-2000 for an exclusive boat. So please negotiate accordingly. Talk to 4-5 boatmen and you will get the idea. Besides photography just enjoy the ride, talk to people observe, see the birds etc. As far as saree weavers are concerned to ask for Weaver colony, your hotel/guest house should be able to guide you to nearest one. A guide is not mandatory but is helpful in learning anecdotes about places you visit. The entire experience of cruising down the Ganga and see the sun shimmer over the waters is beautiful. Thanks Divyakshi… I need to visit the Saree Weavers once again. I have a post on Pochampalli Saree Weavers on the blog, so I have a passion for meeting our artisan keeping traditions alive. So Benaras weavers are on my wishlist to meet and photograph. 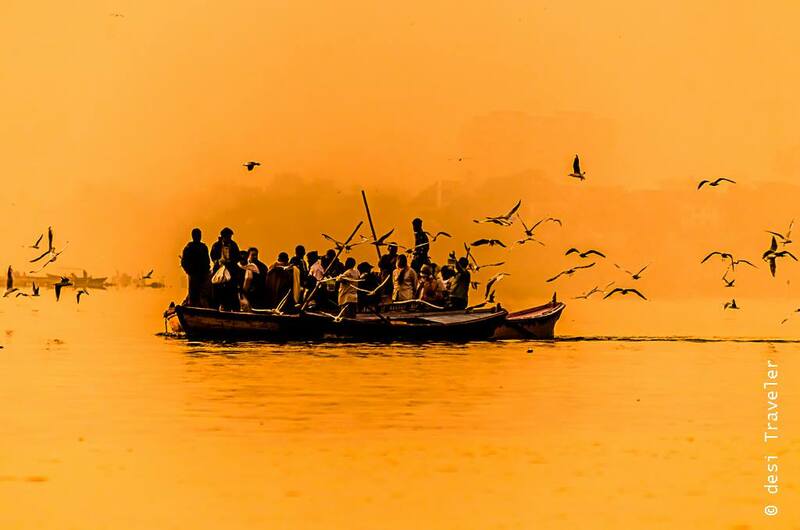 Prasad your river tern picture is so so so stunning! Have you framed it already? Thanks a lot 🙂 , now framing is a good idea..
To me the river symbolises the cycle of life – the pyres that burn on its ghats, men and women deep in mediatation, the lit diyas flicker like hope and the boatmen making the journey of life. 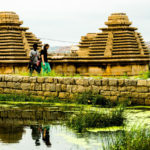 Such a wonderful tour you took us on, Prasad, your words flowed with the pictures in a complementary way in the entire write-up. I love boat rides, especially by one of our sacred rivers. Sunrises or sunsets, I find both of them absolutely gorgeous and equally rewarding in experience but if given a choice, I think I would opt for the sunrise. Can’t wait to do one of these again! Amazing captures, Prasad, Loved them all. Silhouette shots are too good.. It is a lovely ride in the morning with the sea gulls. Nice post and frames, Prasad. Beautifully captured and informative. Regarding the charges – 1000/- exclusive will take one to how many ghats and for how long? Approximately. Thank you. That is a great account. Yes you are right about not being able to differentiate between sunrise and sunset pics unless you know the city well. Great pics. Can you believe I have not been to this city except for a stopover on our way to east India, that when I was a child? Thanks Parnashree…:), appreciate your kind words..